Sheila Finch is one of (short) SF's best kept secrets. This is primarily a self-inflicted situation, for she is not what one would call prolific as a short story writer (30+ short stories, 11 of them here). Her claim to fame comes from her series of Lingster stories, one of which won a Nebula for best novella of 1998 ("Reading the Bones," F&SF, Jan., 1998). 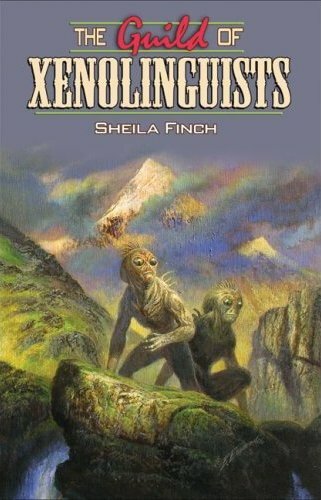 Lingsters, as they are known, come from the Guild of Xenolinguists. When mankind began to spread into the galaxy and other life forms were discovered, it became quickly apparent that communicating with them was a high, nay essential priority. Thus the Guild was formed. These stories are about their travels to other worlds, and how they must overcome the often insurmountable barriers posed in communicating with extraterrestrial species. Which is more difficult than it might seem, for not all means of communication are oral or written. One of the Guild's galaxy-wide duties is first to fathom if a species is indeed even sentient, then painstakingly determine if it is intelligent or even self-aware. The Guild takes its responsibilities seriously and has grown in size, complexity, and importance as mankind encounters ever more civilizations throughout the Orion Arm of the galaxy. It recruits those it feels worthy to join its ranks at an early age, and these young potential lingsters spend years of intensive, rigorous training and education, all of which requires extreme mental discipline. Not all make the grade, and even fewer rise through the ranks to finally become revered members of the hierarchical, decision-making, inner circle. Graduated lingsters comprise the bulk of the Guild's population and are highly prized throughout the galaxy for their unique abilities. The eleven stories gathered here (including one new to this volume, "Stranger Than Imagination Can" and the Nebula-winning novella "Reading the Bones"), tell the stories of individual lingsters, the unique obstacles they must overcome, and how even the most disciplined and dedicated of them sometimes falter through human weakness, or must bend or break Guild rules due to unforeseen circumstances, or life and death situations from which only their training and their own innate sense of right and wrong can save them. Not all survive the challenges Finch sets before them. Replete with plot, incident, action, and color, each piece nevertheless tells a deeply human story, which lies at the very heart of them all. The earliest of the stories ("Babel Interface," Amazing Stories, May, 1988) I read here for the first time. Aside from the new one, I have read each of the others at least twice, a few three times. Which stands as testament to how utterly engaging these stories are, for I had intended to simply refresh my memory on the bulk of them by skimming through them, only to find myself so absorbed in their telling that I read this collection from cover to cover, never begrudging myself the time spent. Following the most recently published story and the first in the book ("First Was the Word," F&SF, June, 2007), which is little more than an introductory piece presaging the very beginnings of the Guild's founding, we are given "A World Waiting" wherein a lingster has traveled to the sea world of Mynah following her sister's death there. She discovers that her sister was two months pregnant at her death, and the only way the members of the exploratory team could save her unborn child was to transplant it into the womb of a native porpoise (which the scientific team is now using to help with their communication problem with the indigenes). This initial setup is fascinating and, as with all of the stories, Finch works its angles masterfully, logically, and with full awareness of how to draw the most tension out of any postulated situation. The climax, the birthing of the child, brings its own surprises, as the child isn't quite what might be expected. End of story. Almost. For eight years later (again in F&SF), Finch continues the story of this strange child born of woman and porpoise in "The Roaring Ground." She is now grown, is a student of the Guild, and has had to overcome enormous physical obstacles due to her... differentness. Her story is as opposite as night and day from its predecessor (as are all of the stories highly individual in nature), and proves an un-put-downable page turner as well. With each story we learn a bit more about the Guild's colorful history in background, and are reminded of the Guild's strictures/rules (no marriage for its members, no cultural interference or taking sides with one client against another, and others), which form the backbone of its legitimacy and respect throughout the galaxy. Also repeated throughout the stories (and a major component of them) are reminders of how mentally disciplined the lingsters must be, for each of them carries a drug pouch, said drugs tailored for specific situations which allow lingsters to dip into a sort of universal consciousness, thus permitting them to better understand the deep-seated world view of the alien species with which they are in contact; said world view determining the basis for communication and the various strange forms it may take. Finch also has a bit of the poet in her, for her descriptions of the worlds she creates, as well as the detailed aliens and their sometimes unfathomable mindsets, are rendered beautifully, and in language the reader can appreciate. While each story is thoroughly engaging on several levels, perhaps the penultimate story is "Reading the Bones." As I wrote in a column here some ten years ago, and after reading it over for this review and seeing no reason to alter my words, I repeat with no equivocation that "Reading the Bones" combines the best elements of the previous Xenolinguist stories. From the theoretical and abstract elements of linguistics to the characteristically brutal and savage violence marking several of the earlier pieces, all is emotionally and artistically capped by the powerful denouement involving the redemption of the main character, Ries Danyo. "Reading the Bones" is the final, and longest story in the book, but by the time you get to it you're already well aware that you've been reading a collection of very unique, very special stories. After turning the final page of "Reading the Bones" this awareness is brought home with the soft puff of the book closing in your lap as a whispered "wow" escapes your lips. All previous Lingster stories are collected here; you get them all in one handsome package. There's a fine Foreword by Ian Watson, and a stimulating Afterword by the author, which draws attention to the many inherent problems when dealing with language, linguistics, and various unthought-of forms of communication in general. This is quite a collection, made only more beautiful by the elegant Bob Eggleton cover. Highly recommended. The Guild of Xenolinguists appeared in August, 2007, and is Golden Gryphon title #52. Sheila Finch is hard at work on a new Lingster story, ostensibly set somewhere near the end of the Lingster cycle (though this will not, thank goodness, preclude her writing fictionally earlier tales in the future). For completists, there are two Lingster novels. The first, Triad, was published many years ago by Bantam. More recently (October, 2003), Tachyon Press published the novel Reading the Bones, which is a fix-up. It includes the complete text of the title novella, and then continues the story with another novella "Bright River of Talk." There is an "Interlude" which bridges the novellas to provide continuity. 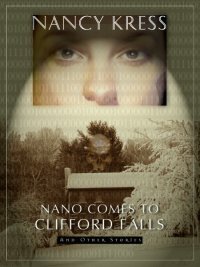 May of this year saw Golden Gryphon debut Nancy Kress' latest collection Nano Comes to Clifford Falls and Other Stories (GG title #54), and it is quite possibly her best to date, which is saying a lot. As with Sheila Finch, Kress pens my kind of SF. It is soundly grounded in either science or technology (nano-tech features prominently in several of Kress' stories), but never forgets to relate how aspects of new technology affect human beings. In essence, you get two stories in one with Kress, and she has perfected the art of blending them together in remarkably satisfying ways. An excellent example is the title (and award-nominated) story "Nano Comes to Clifford Falls" (Asimov's, July, 2006). Basically, it poses one simple question: what would people do, how would they react, how would their life change if a nano-tech machine could create anything and everything they desired? Well, when nano-tech comes to the small town of Clifford Falls, we learn the answer as seen through one woman's eyes. Does it free the townsfolk from toil, enabling them to partake of higher, loftier pursuits? Freed from want, how do they fill their free time? Kress supplies some answers, with a keen eye toward the human condition and what makes common folk tick. "Shiva in Shadow" (Between Worlds, ed. Robert Silverberg, SFBC, 2004) takes several sfnal ideas and weaves them together in a suspenseful new way. An exploratory team has downloaded its separate consciousnesses into AIs aboard a probe heading for the galactic core. The flesh and blood humans are in a constant feedback loop with their AI counterparts, who can gather and transmit more information than could their human counterparts because of their ability to insert themselves closer to the violent core than could a human being. Kress flits back and forth between them from chapter to chapter, and is thus able to provide two sets of points of view from which to tell this remarkable story. Since the AIs aboard the probe are in essence the human crew, the human crew can almost anticipate what their machine selves are thinking, and vice versa. But Kress doesn't stop there. When an unexpected wave of violent forces engulf the Probe Ship (which has somehow gotten too close to the core), almost destroying the AI avatars, shutting them down, it is up to both machine and human intelligences to save each other. An ingenious symbiosis, to say the least, but one arising from a scientific problem surrounding the forces at work around a black hole at galactic center. The detail Kress works into the story on both the astronomical and human character levels makes for a stimulating, thought-provoking ride. "Mirror Image," (One Million A.D., ed. Gardner Dozois, 2005) one of the most awe-inspiring, sensawunda tales in the book, involves an AI named QUENTIAM. It literally controls the universe, and everyone is plugged into it. It can do anything, anything at all, and allows any and all beings to do as they will, with very few restrictions. QUENTIAM is the ultimate high-tech God, the benevolent creator and master of the universe. This story gets much too complicated to explain here, but suffice to say that one of a member of a close-knit sister pod inadvertently violates a cardinal rule, which has led to the death of a planet. She is exiled to a world from which there is no rescue or escape. But while investigating her transgression, something doesn't add up and points to QUENTIAM as the culprit. But QUENTIAM can do no wrong, knows all and sees all (including thoughts), so how to rescue their sister and convince QUENTIAM of its error? The story is worked out marvelously, as a mystery to be solved and as a harrowing rescue mission. As with all of Kress' stories, even the less cosmic or more humorous, somehow she keeps one flipping those pages. Along with very few others working today, Nancy Kress is a master of the short form science fiction story. Her Nebulas, a Hugo, and a Theodore Sturgeon award are testament to the fact. Nancy Kress takes complicated ideas and makes them look simple, which belies her brilliance. When Nano Comes to Clifford Falls is chock full of these deceptively simple, but brilliant stories, and if you pass this one by you'll regret it. SF that engages the mind and touches our humanity, either collectively or individually, are the characteristics marking virtually all of these wonderful tales. The thirteen stories collected here run from 2000 through 2006, and are the best of her recent short work. Mike Resnick provides a colorful and heartfelt introduction, while Kress tells a little about each story, or how it came to be, in individual afterwords. What Sheila Finch's and Nancy Kress' stories both have in common is that they forthrightly and joyously deal with core SF ideas and then unerringly show their impact on individual people. And while both of them are well-versed in their scientific concepts well enough to be able to extrapolate intelligently, and in detail, from them, they both have enough of the storyteller and poet about them to make the science and the human dimension things of beauty and wonder. Dave Truesdale has edited Tangent and now Tangent Online since 1993. It has been nominated for the Hugo Award four times, and the World Fantasy Award once. A former editor of the Bulletin of the Science Fiction & Fantasy Writers of America, he also served as a World Fantasy Award judge in 1998, and currently writes an original online column for The Magazine of Fantasy & Science Fiction.